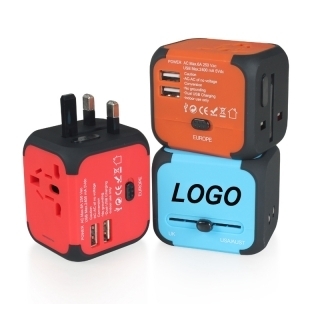 Colorful universal portable world wide travel adapter with 2 USB ports, 3 plugs build-in one. It's a small pocket-sized power adapter set for go-anywhere convenience. This all-in-one unit provides plug adapters for use in more than 150 countries, such as USA, UK, EU, AUS, Asia and so on. So you never need to be at a loss for power again. With CE & Rohs certificate. Thunder strike protection. Charging indicate with LED light. Can charge your phone and tablet PC at the same time. Rated voltage 110-240 V/AC, Rated current: 10 A. Many colors and your customized logo is available. 2 1/2"x 2 1/8"x 2 1/8"